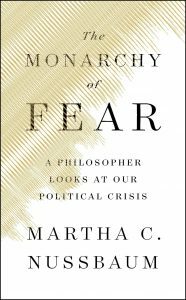 In the preface to her recent book The Monarchy of Fear, philosopher Martha Nussbaum observes that “academics can be too detached from human realities to do good work about the texture of human life.” She then notes that her own commitments and efforts have led her to “want to restore to philosophy the wide set of concerns that it had in the days of the Greeks and Romans; concerns with the emotions and the struggle for flourishing lives in troubled times; with love and friendship; with the human lifespan; with the hope for a just world.” Even if Nussbaum’s book were lifeless or banal, this effort at restoration would still be commendable. Fortunately, as might be expected given Nussbaum’s illustrious career, her latest book is as erudite, compassionate, and invigorating to read as her various earlier works, including my personal favorite The Fragility of Goodness. But while Nussbaum is not afraid to speak to the particulars of our political moment—a rather memorable example being when she categorizes Donald Trump’s misogynistic comments under the labels “blood, weight, bathroom, breastfeeding, and attractiveness”—she rather prudently spends most of her time grounding her insights in close readings of stories, both ancient and contemporary, leaving it to the reader to connect the dots. Nussbaum connects this visceral experience of fear and anger to the experience of infancy. She reminds us that as infants, “we come into a world that we are not ready to cope with. (And in a crucial sense we never really are.) Terribly soft and vulnerable, we lie there helpless, waiting for others to provide what we need—food, comfort, and reassurance.” In Nussbaum’s view, while we “usually survive this condition. We do not survive it without being formed, and deformed, by it.” And more specifically, “fear, genetically first among the emotions, persists beneath all and infects them all, nibbling around the edges of love and reciprocity.” This line of argumentation leads Nussbaum to make the bold claim that “politics begins where we begin,” rooted in those same affects: fear of vulnerability and anger at our own dependency. In keeping with her own observation that “if we ought to be pursuing valuable social goals, then we ought to motivate ourselves to pursue them—and this means embracing hope,” and further that “hope involves a vision of the good world that might ensue, and, often at least, actions related to getting there,” Nussbaum ends her book with broad suggestions for cultural domains that can help cultivate the virtues necessary for good citizenship. Nussbaum emphasizes each of these domains because she believes that “we need to treat that other person as a person, having depth and an inner life, a point of view on the world, and emotions similar to our own.” By cultivating our own interior life through these domains, we can develop the awareness needed to see and respect the interior lives of others. Her argument boils down to “this sort of faith, crucial in personal love and friendship,” a faith that “we also need in political life.” Nussbaum implores us to “think of our opponents as having capacities for reasoning and a range of human emotions, whether badly developed and used or not.” If we can heed that call, leaving behind the monarchy of fear and entering into the democracy of love and responsiveness, we can begin to heal the wounds that mar our nation. Anthony M. Barr is a student in the Templeton Honors College where he studies history, literature, and Orthodox thought and culture. He frequently writes for Ethika Politika and Circe Institute and has done research on political theory, education policy, and civic and moral virtue for various nonprofits, businesses, and independent publishing companies.